In these lessons, we will learn how to solve distance word problems where the objects are traveling in different directions. Distance problems are word problems that involve the distance an object will travel at a certain average rate for a given period of time. The formula for distance problems is: distance = rate × time or d = r × t.
Make sure that you change the units when necessary. For example, if the rate is given in miles per hour and the time is given in minutes then change the units appropriately. It would be helpful to use a table to organize the information for distance problems. A table helps you to think about one number at a time instead being confused by the question. 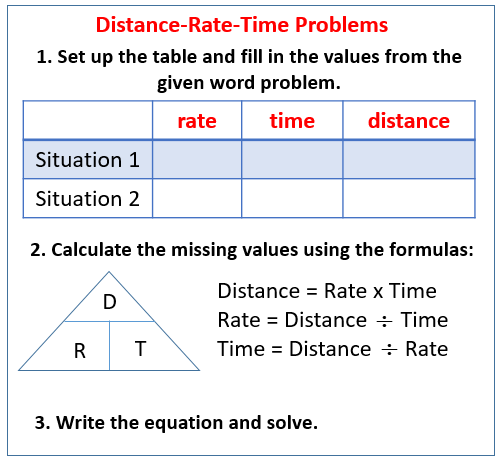 The following diagrams give the steps to solve Rate Time Distance Word Problems. Scroll down the page for examples and solutions. A bus and a car leave the same place and traveled in opposite directions. If the bus is traveling at 50 mph and the car is traveling at 55 mph, in how many hours will they be 210 miles apart? Step 1: Set up a rtd table. Step 2: Fill in the table with information given in the question. If the bus is traveling at 50 mph and the car is traveling at 55 mph, in how many hours will they be 210 miles apart? Let t = time when they are 210 miles apart. Answer: They will be 210 miles apart in 2 hours. In this video, you will learn to solve introductory distance or motion word problems -- for example, cars traveling in opposite directions, bikers traveling toward each other, or one plane overtaking another. You should first draw a diagram to represent the relationship between the distances involved in the problem, then set up a chart based on the formula rate times time = distance. The chart is then used to set up the equation. Two cars leave from the same place at the same time and travel in opposite directions. One car travels at 55 mph and the other at 75 mph. After how many hours will they be 520 miles apart? Two cyclists start at the same corner and ride in opposite directions. One cyclist rides twice as fast as the other. In 3 hours, they are 81 miles apart. Find the rate of each cyclist. Brian and Jennifer both leave the convention at the same time traveling in opposite directions. Brian drove at 35 mph and Jennifer drove at 50 mph. After how much time were they 340 miles apart? Two joggers start from opposite ends of an 8 mile course running towards each other. One jogger is running at a rate of 4 mph. The other is running at a rate of 6 mph. After how long will the joggers meet? Bob and Fred start from the same point and walk in opposite directions. Bob walks 2 mph faster than Fred. After 3 hours they are 30 miles apart. How fast does each walk? Trains A and B left stations R and S simultaneously on two separate parallel rail tracks that are 350 miles long. The trains pass each other at point X after traveling for a certain amount of time. How many miles of the rail tracks has train A traveled when the two trains passed each other? (1) Up to point X, the average speed of train B was 25% less than the average speed of train A. (2) Up to point X, the average speed of train B was 60 mph and it took two and a half hours for train B to arrive at point X.